MALLET -Isle de Terre Neuve. MALLET, A.M. - Isle de Terre Neuve. Isle de Terre Neuve. - MALLET, A.M. Title : Isle de Terre Neuve.. Size : 5.7 x 4.1 inches. / 14.6 x 10.3 cm. 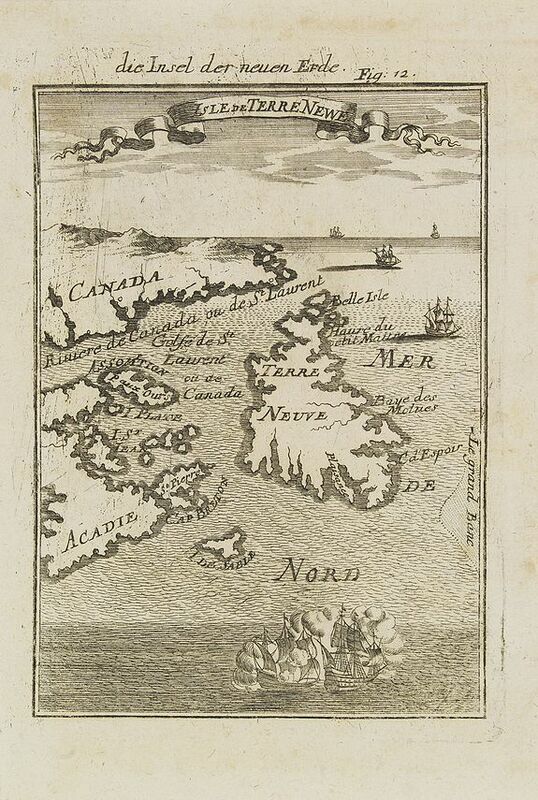 Description :Charming map centered on the island of Newfoundland, covering also the land around the St. Lawrence Gulf. Embellished with 6 sailing ships and hills in the Labrador area. From the German text edition published by Davis Zunners. Allain Manneson Mallet (1630-1706), a well travelled military engineer and geographer who worked in 17th century France under King Louis XIV. Condition : Minor discolouration due to the oxidation of ink from an adjacent text page. Else good condition.